Kindness, when one person demonstrates benevolence, thoughtfulness and gentleness towards an individual or individuals who are part of a team or work group. Kindness, depending on the situation or circumstance, may not always be an easy emotion to feel nor an action easy to deliver under conditions of great stress, expectation or conflict. This version of The Kindness Journal was created to assist individuals or teams who want to bring the principles taught in the book “The Business of Kindness” into their daily workplace and work life. It will help you bring more kindness into your own life and to the lives of others you work with, learn from, mentor or manage. As schools, workplaces and communities across the globe wrestle with ways to address the seriousness and impact of the Bully, books like this one began to raise flags, create awareness and push for change back in 2006. Political and legal voices have recognized the impact cyber bullies, school bullies and workplace bullies have had over the past 20 years, and leaders are now taking a long look at what we can do to improve our communication, engage our compassion and act with kindness and strength. The Business of Kindness raises our awareness to the character traits that create a positive workplace, school or home environment. In this book, you will learn how to build a culture of kindness and tolerance while at the same time establishing standards of practice, excellence and respect. 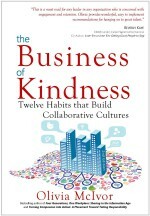 This book offers behaviour how-tos, practical stories and thought provoking exercises that can challenge you and move you towards a culture of kindness. The best selling practical guide to help you establish a culture of tolerance, courage and kindness. This set of 16 Kindness Cards help people build better relationships at work. 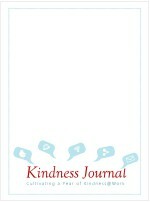 This card set is an active supplement to the book The Business of Kindness by Olivia McIvor. It was created as a quick reference tool to assist individuals in putting into practice the tools discussed in her bestselling book “The Business of Kindness: creating environments where people thrive”. Focusing on over 80 ways to put kindness into Action no matter where you are! Four Generations One Workplace gives us a look at the unique people within our workplaces today. This is a book that educates us in an entertainingly witty way about the four generations influencing, enhancing and challenging workplaces across North America. 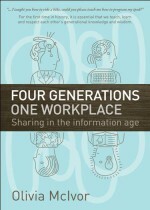 This well researched title takes us on a critical journey to better understand the intricacies and dynamics of the four generations (Pre-Boomers, Baby Boomers, Gen X and Gen Y) in the workplace. These cards were originally created as a useful tool for training session and group change programs. We received emails and calls asking if they could be purchased in larger sets to encourage dialogue and goal setting. Compassion is the bedrock of a healthy society. 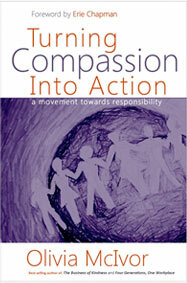 McIvor’s Turning Compassion into Action urges each of us to craft engaged and meaningful lives. She believes we must each embrace the innate wellspring of compassion within us and impact our world, one action at a time. To actualize compassion we need to transform our pessimism into optimism; connect to the deeper purpose of our work; expand our communities to create more belonging; and be intentionally present with ourselves and others. This is Ms. McIvor’s third book.